Staffing figures from the Department of Public Instruction show a spike in the number of teachers leaving the workforce following 2011 Act 10. In recent years, that number has returned to “normal” and districts have been able to replace those departing. However, districts are facing a new challenge as growing numbers of young teachers are leaving the profession. While education policy often spurs contentious debate, few dispute the importance of high-quality teachers. In Wisconsin and nationwide, school districts are facing challenges in both the quality and quantity of teachers. In fact, new teacher licensure and preparation provisions in the latest state budget show particular urgency in ensuring enough teachers in Wisconsin classrooms. A recent Wisconsin Policy Forum analysis of Department of Public Instruction (DPI) staffing data between the 2009-10 and 2015-16 school years explores the teacher supply issue in detail. Wisconsin public school districts employ about 60,000 teachers. Between 2009-10 (2010) and 2015-16 (2016), the number of teachers declined 2.2% (1,388 teachers) from 61,365 to 59,977. During those years, student enrollment fell 0.5%. A closer look shows the number of teachers declined by nearly 2,000 during the first two years studied, followed by an increase of 621 (about 1%) during 2012-16. During that latter period, student enrollment dropped about 0.4%. Beneath those macro numbers is turnover: those leaving the profession for retirement, taking a job in another field, or leaving the state; and teachers new to Wisconsin’s teaching ranks (i.e., not a Wisconsin teacher in the prior year). 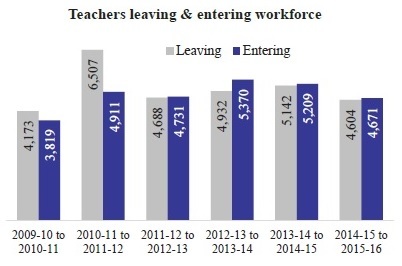 Immediately following enactment of 2011 Act 10, 6,507 teachers left the workforce, compared to 4,173 the previous year (see gray bars in chart). With some districts believing the cost savings from Act 10 would not compensate for a 5.5% reduction in school revenue limits that year, districts did not replace all departing teachers (see blue bars in chart). In recent years, departures have levelled off to between 4,604 (2016) and 5,142 (2015). In fact, the number leaving in 2016 was the lowest since the year immediately preceding adoption of Act 10. Moreover, since 2012, school districts statewide have replaced all of the departures and added to the teaching ranks. In each of the last four years studied, the number of teachers entering the workforce outpaced those departing. However, while school districts generally have been able to attract sufficient educators to replace those leaving, anecdotal evidence suggests recruitment challenges exist for certain subjects, student populations, and geographic areas. The common perception of teacher turnover is more experienced teachers being replaced with younger, less experienced ones. The data show it’s more complicated than that; the age profile of those leaving is varied. The average age of departing teachers in 2016 was 46.4 years and has remained fairly consistent, ranging from 45.2 in 2015 to 47.7 in 2014. Notably, relatively young teachers—those in their 20s and 30s—made up 37% of teachers leaving the workforce. This share was almost as large as the share of those 55 or older (40.6%). Moreover, the number of “young” teachers leaving the profession has ticked up in recent years, from 1,565 in 2011 to 1,728 in 2016. That shift shows when average experience levels are examined. Among those leaving the workforce in 2015 and 2016, average experience (14.7 and 15.8 years, respectively) was below levels from earlier—a range from 16.4 years in 2013 to 20.5 years in 2012. Among teachers who left the profession in 2015 and 2016, more than 40% had less than 10 years of experience, compared to 36% during 2013 and 2014 (see chart). What may be even more concerning, though, was that in the last two years studied, nearly one-in-four left before reaching their five-year mark. That share was up significantly from 20% in 2013 and 2014. Without survey data, it is difficult to isolate the reasons behind recent departures of younger, less-experienced teachers. With a strengthening economy and low unemployment rates, attrition of early-career teachers may be driven by a rise in the availability of higher-paying jobs. High pre-retirement attrition of Wisconsin teachers imposes additional training and development costs on schools and districts. It may also threaten their ability to maintain a stable teaching corps and adequately staff classrooms. Moreover, national research confirms our findings that attrition among minority teachers, who tend to be concentrated in high-poverty and high-minority schools, are higher than overall attrition rates. The result is a higher proportion of inexperienced teachers in schools serving high concentrations of low-income and minority students, which may impede the closing of achievement gaps.